A preservation project on the roof of Roseland Cottage in Woodstock, Connecticut, is making way for the restoration of two of its notable architectural features: pinnacles and pendants. Whereas Downing’s design includes only one pinnacle and pendant, Roseland Cottage displays nine such pairings. While each pendant follows the same turned design (with the principle pendant being about two inches greater in diameter), the pinnacles show two designs. Six of the pinnacles have a turned design while three display an elongated pyramid rising from the turned base. 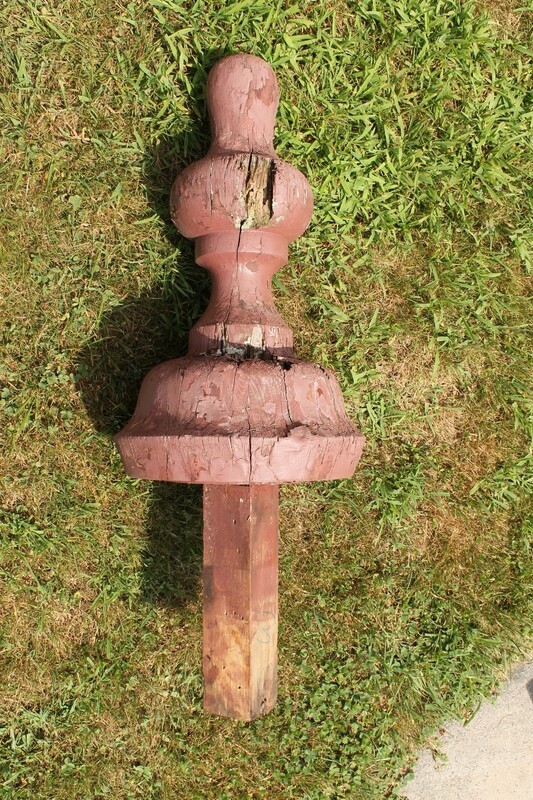 At the outset of the Roseland Cottage roof project, three of the turned pinnacles were missing and the principle pinnacle had toppled during a recent winter storm. With all of the objects removed, it was clear that some could be repaired, but some needed to be replicated. It is still not clear exactly how old the existing pieces are. There appear to be only two to three layers of paint on each one, suggesting an age of twenty to thirty years, but given their location it is possible that they were not painted as frequently as the body of the house. Some hints in archive files suggest that some of these were replicated during roof work in 1980. Once the repair and replication work is completed and the new roof laid down, the pinnacles and pendants will be returned to their rightful location as distinctive features of this crown jewel. This conservation and replication of the finials is partially funded with a grant from the 1772 Foundation and comprises just a portion of the larger $250,000 roof restoration project that is now underway. 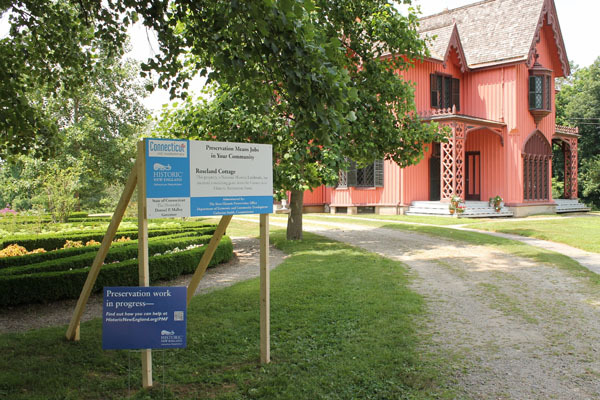 The roof work is partially funded with the assistance of a matching grant from the Connecticut Historic Restoration Fund through the state Department of Economic and Community Development. Historic New England is actively fundraising to make up the difference between the funding and the project cost. 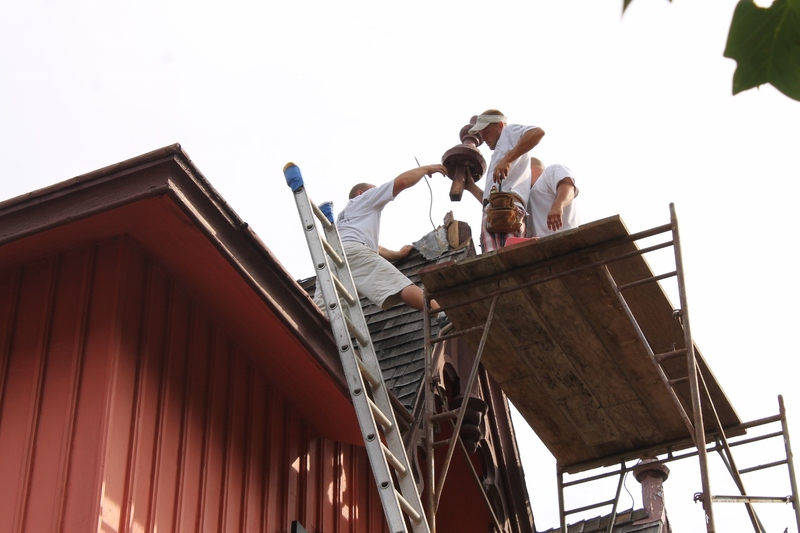 Your contribution to the Preservation Maintenance Fund may be the difference that allows us to restore the historically appropriate clipped shingles. Make a gift to the Preservation Maintenance Fund.